It has its hitches, but if you love a good action or tower defense game, this one's for you. When someone talks about Zen Studios, it's usually referred to as "that pinball studio". And let's be honest, it's something that it does really well. Zen Pinball and Pinball FX 2 have seen quite a boost in community over the years, and that has since pushed into the stratosphere with the release of Star Wars Pinball earlier this year. 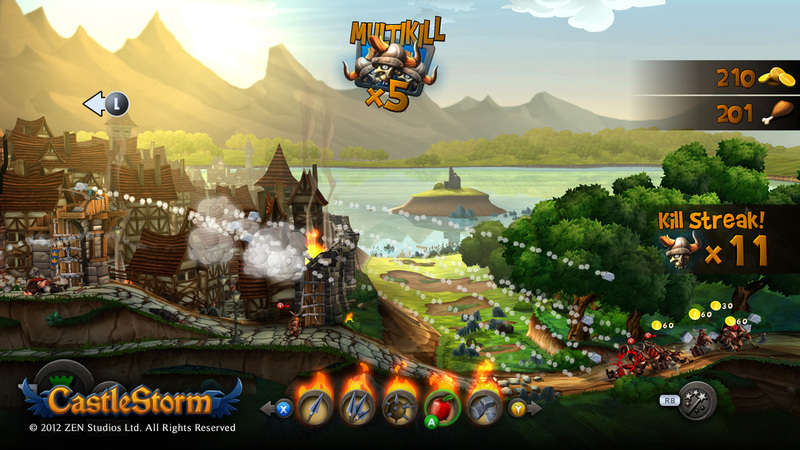 But CastleStorm, now available on Xbox Live Arcade, shows a different side of the publisher, and one that I certainly hope to see more often going forward. Not that I don't enjoy its pinball games – I really do – but this tower defense/action game really sets out to do something different for the genre. Most of the time, it doesn't feel like the "same old grind" that most tower strategy games fall into, instead providing a fresh take on how to complete your objectives, whether you feel like letting loose with an ammo-bursting ballista, or letting your ground forces do damage. It actually gives you options that enhance the experience, rather than hampering it. Who'd have thunk it? In the game, you're Sir Gareth, a knight who's out to retrieve the sacred jewel that's been stolen from his kingdom. It turns out some no good Vikings have gotten their hands on it, and if that's not enough, they want to crush Gareth's kingdom as well. So, he calls upon his team of soldiers and defensivemen to not only keep his castle intact, but also take back the Vikings' territory, one inch of land at a time. The game relies on a sense of humor, and though some jokes have worn out their welcome (another reference to "arrow to the knee"?! ), it's nice and breezy, and ideal for players of all ages, rather than dragging in the gutter.